The New York Knicks overcame Golden State guard Stephen Curry's NBA season-high 54 points to beat the Warriors 109-105 on Wednesday. 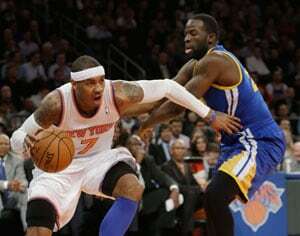 Carmelo Anthony scored 35 points and J.R. Smith hit the tiebreaking shot with 1:10 left to help give the Knicks the win. Curry finished with seven assists and six rebounds while passing his previous career-best of 42 points, and Kevin Durant's 52-point performance that had been the best in the NBA this season. But he had little help without All-Star forward David Lee, who was suspended one game for his role in an altercation Tuesday night in Indiana. Oklahoma City's Russell Westbrook scored 29 points and Kevin Durant recorded his third career triple-double as the Thunder finished a perfect three-game homestand by routing the short-handed New Orleans Hornets 119-74. Durant had 18 points, 11 rebounds and 10 assists as Oklahoma City finished a dominant four-game sweep of the season series against New Orleans, which was without starters Anthony Davis (shoulder) and Eric Gordon (knee). The Thunder led by at least 29 in three of the four meetings this season. At San Antonio, Jermaine O'Neal had 22 points and 13 rebounds, and Wesley Johnson hit a 3-pointer at the end of regulation to force overtime as the Phoenix Suns beat San Antonio 105-101 to end the Spurs' 18-game home winning streak. Luis Scola added 15 points and Goran Dragic had 13 points and 13 assists for Phoenix, which ended a six-game losing streak against San Antonio. Zach Randolph scored 22 points and Marc Gasol added 21 at Memphis as the Grizzlies matched their largest comeback in franchise history, rallying to beat the Dallas Mavericks 90-84. Quincy Pondexter finished with 12 and Austin Daye added 10, all in the first half, for Memphis, which trailed by 25 points in the second quarter but stormed back to win its eighth straight. Gasol had 12 rebounds and Randolph 10 as Memphis outrebounded Dallas 46-34. Cleveland rookie Dion Waiters scored 23 points and Shaun Livingston added 15 as the Cavaliers overcame a horrendous start and playing without injured All-Star Kyrie Irving for the second straight game, beating the Toronto Raptors 103-92. Tristan Thompson scored 14, Wayne Ellington added 13 and Luke Walton had seven rebounds and seven assists for the Cavs, who closed with a 10-2 run. The Detroit Pistons escaped with a 96-95 victory over the Washington Wizards as Brandon Knight returned from a right knee injury to score a career-high 32 points, and John Salmons had 21 points to lead six players in double-figures as the hot-shooting Sacramento Kings cruised past the Orlando Magic 125-101. In other games, the Milwaukee Bucks beat the Houston Rockets 110-107, the Atlanta Hawks downed the Utah Jazz 102-91 and the Denver Nuggets were 111-109 victors against the Portland Trail Blazers.